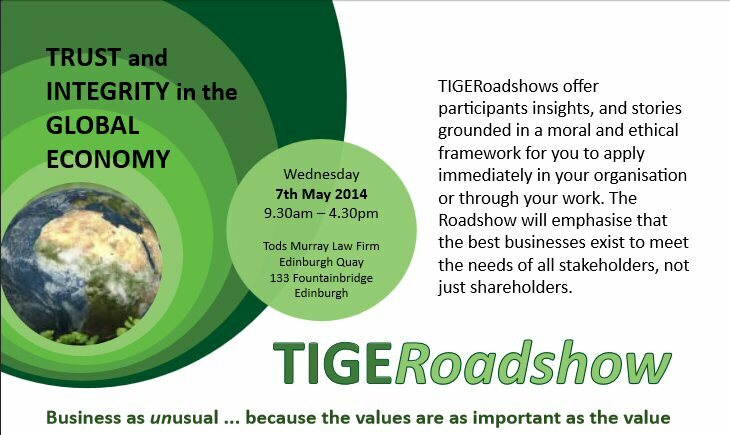 TIGERoadshows draw together highly regarded speakers, corporate delegates, social entrepreneurs and local authorities around embedding integrity and trust into our organisations and business life. The aim is to explore and understand the ethical dimension as a fundamental aspect of good business; to propagate new social and ethical enterprise models; and to share in the learning and experiences of leading practitioners. The Roadshow is also a forum for access to specialist organisational and personal support, consultancy and networks. This will help you to implement the organisational changes that bring about the right ethical values for a good organisation. This will be a compelling, lively and thought provoking event, coming at a critical time. Join us to learn from people and organisations who are getting it right. Let’s get motivated by a dynamic day and a shared commitment to economic change. Lady Susan Rice, Managing Director, Lloyds Banking Group Scotland will give the opening words of welcome to the day. David Erdal, is a leading advocate of employee owned companies and author of the book ‘Beyond the Corporation: Humanity working’. Dr Deborah Benson, former MD of Miller Homes. Tony Bradley, Director of The SEED Centre (for Social & Ethical Enterprise Development) within Liverpool Hope Business School. Pat Armstrong, Chief Executive of the Association of Chief Officers in Scottish Voluntary Organisations (ACOSVO). Ian Monteague, Chair of Family Action in Rogerfield and Easterhouse (FARE), Glasgow. Working sessions – lessons from the day in syndicates and proposed next steps. learning and action points from group discussions. Feedback to the plenary and conclusion to the day led by Mike Smith. £60 per person. Price includes: refreshments, lunch, networking opportunities, discussions, presentations by local successful social enterprises and Q&As with the speakers.